Museums are looking at video-games as both an art form and a means to reach a wider audience. It can seems a strange relationship between the “houses of the past” and the the ultimate creative medium, but games have shown the positive impacts in terms of the audience development, audience engagement and all over the user’s journey: pre-during-post experience. There are tremendous opportunites for creative industries to work with cultural institutions and vice versa, right now are just scratching the surface. In the near future museum should avoid a prevalent tendency to attach game-like mechanics to didactic exercises in delivering information. Games must be foremost games, only then we can achieve our “cultural” goals. It’s an innovative way to get the public interested in collections, especially audiences that wouldn’t normally engage with them.” says Stella Wisdom, the British Library’s digital curator. Despite the rise popularity of the game industry and the positive impact on several human being behaviours, only few worldwide institutions adopted properly this medium in order to reach and engage audience. The aim of the following (partial) list is to give visibility to the best video-games published by museums in order to get the “museum out of the museum”. The Tate Modern ‘Race Against Time’ app is a game that the London-based modern art gallery has released to provide people with a more fun and interactive way to experience art. Users playing as a chameleon that must save colors from being removed by Dr. Greyscale, the game’s villain, throughout modern art history. The chameleon travels through time, beginning in 1890 and experiences major art movements as well as different artworks and enemies that reflect the time period, describes PSFK. I really loved the “Turbo Mode” option, a way to create a tied relationship between the digital experience and the museum visit. Only doing a check-in inside the building the player unlocks new power ups in the game. 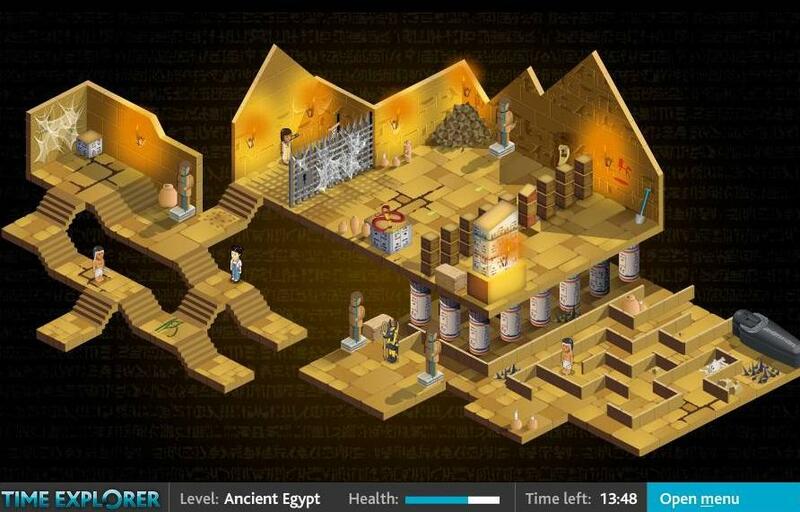 Time Explorer is an isometric flash game which allows you to travel back in time via The British Museum. The aim is to rescue precious artefacts, and in doing so find out more about them and the civilisations that created them. There are four levels, each taking you on a treasure hunt to ancient destinations across the globe. Starting in the museum’s Great Court space, players can choose Ancient Rome, Aztec Mexico and Imperial China levels, select characters and access score information to check rankings against other online players. Nubla proposes an adventure that begins in the halls of the Thyssen museum. Following him, we begin a journey that will take us to discover the wonderful world of Nubla, full of puzzles and forgotten places. Who has not dreamed of plunging into one of the paintings hanging on the wall of a museum and venture into an unknown world? Throughout this first chapter of Nubla the underlying theme of our game is the construction of identity, something that we will discover from conceptualizing inspired by the art, many challenges in the form of puzzles that we face, discovering the forgotten world of Nubla. Nubla, is not only a game but an interesting educational project that puts in dialogue the art, technology and new narratives. It generates, in certain ways, a reinterpretation and creatively vision of the works of the museum. Backgrounds, characters and game mechanics are inspired by works and artistic styles, bringing the world of art in a playful and fun way. A video game released in 2001. It was developed by Cryo Interactive Entertainment and published by Réunion des Musées Nationaux for Windows-based PCs and the Sony PlayStation 2. The game is set in 1700 at the time of the death of King Charles II. The player assumes the role of Charles-Louis de Farevolles, who turns up at the Court of Louis XIV, with neither influence at Court nor money. While trying to solve the plot, the player experiences the social life at the court, interacting with historical characters, collecting objects and puzzle solving, immersed in a full 360 degree panorama that recreates the 17th century Versailles down to the smallest detail, with historical accurate validation. The game as unique features in the palace reconstruction and daily life reenactment, based on a set of historical specifications defined by Beatrix Seulle , at the time chief curator of Versailles: Each piece of the palace is modeled in 3D based on this period’s maps and engravings. The game maps and textures are produced from a photographic survey at the place and decorative fabrics are selected amongst the archives of the Musée des Tissus de Lyon. Players will interact with fictional characters and real objects from the three historic periods of Mesopotamian history: The Uruk Period (3300-3000 BC) when writing was first developing; the Ur III period (2100-2000 BC), a time of great cities and central organization; and the Neo-Assyrian period (1000-600 BC), a time of empires. The player will interact with them in the present day context in order to solve a series of challenges. 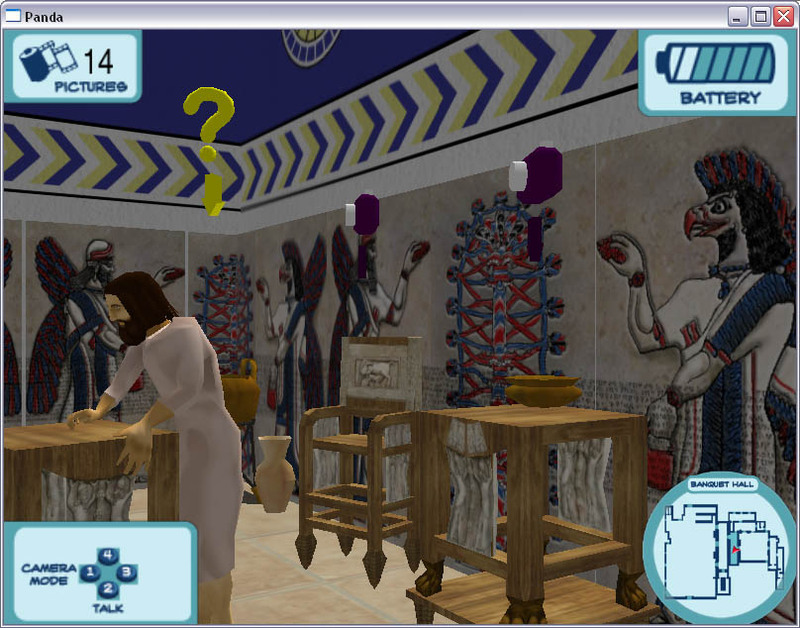 In the process, the player will absorb historical information and became more familiar with museum and library resources. The project in its entirety exposes the player to three historical periods in addition to an accurate modern day replication of the Walters Art Museum. It’s an adventure game that follows the story of the released motion picture. The player is put in the role of Larry Daley, former night guard of New York’s American Museum of Natural History and has to explore and adventure into 14 levels that are inspired by actual Smithsonian museums and other Washington DC historical places, like the Lincoln Memorial and the Federal Archives, and interacting with both fictional and historical characters such as Napoleon, Benjamin Franklin, Amelia Earhart and Al Capone. The game’s progression is based on solving puzzles, finding artifacts, collecting items in a platform-like gameplay that also contains “mini-games as trivia questions, in-game audio-tours and factoids that relay historical facts about the exhibits”. The museums’ game representation is based on schematics of its real counterparts, reinforced by the use of recognizable visual elements, a process that is extended to the creation of a fictional “composite art museum that is really an amalgam of the best parts of all art museums”, due to the variety and diversity of them, according to game developer Jeremy Mahler (Pipeworks). 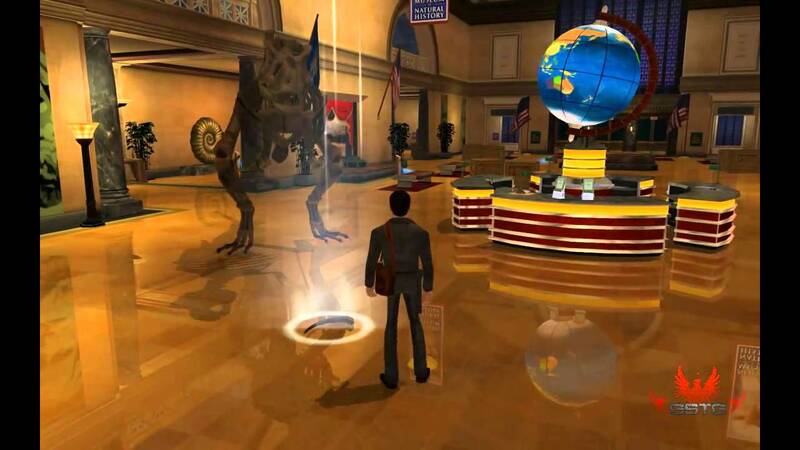 A 2009 PC/console game published by Majesco Entertainment and completely set at the Smithsonian Museum. 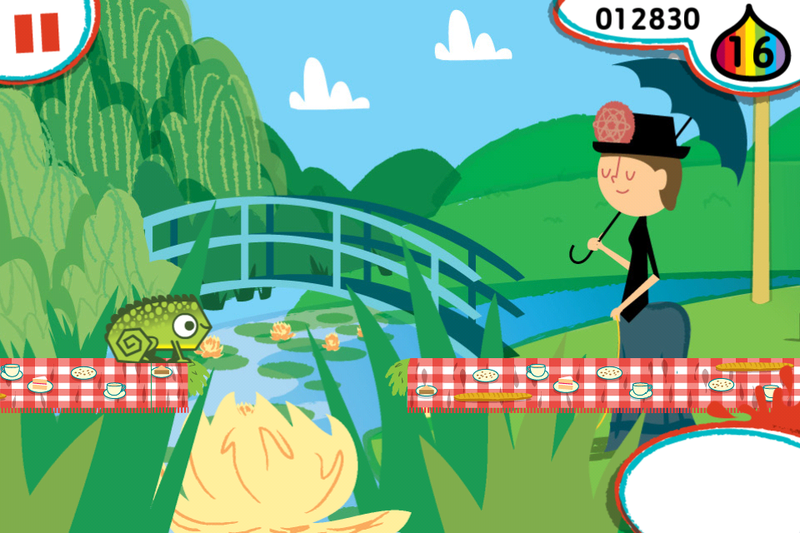 MicroRangers is a new mobile game at the Museum that shrinks you down to microscopic size and sends you into exhibits to combat threats to biodiversity. Nine MicroCrises await—real-world scenarios involving microorganisms— starting in the 1st floor Hall of Biodiversity. For advanced game players, marshall your resources to take on the 6th Extinction. Armed with the mobile app and a free Communicator Coin, augmented characters – both microbes and scientists – will send you on missions and help you along the way. Have fun while you learn how even the smallest things can make a big difference. MicroRangers employs a range of technologies to: geolocate you within the Museum, offer augmented animated characters to guide you, and provide mini-games that bring the dioramas to life. Rizk is a part of the museum’s “Climate Changing” series of exhibitions, events and installations. This “tower defense” strategy game was created by the UK-based creative studio Playerthree, and is set on a dark and mysterious planet. Players are put in control of an immobile plant that falls from the sky and must scour the landscape for resources. In order to grow, the plant sends out various “collectors” to find different resources so it can flourish. However, you’re not the only plant to keep track of! As the levels progress, the player will encounter various threats that pose a risk their plant’s existence. As you send out more collectors, your risk level rises and aggravates the enemy plants causing them to release spores which can damage your plant. However, your mother plant can also send out “defenders” in strategic locations to fend off the spores. Each new stage challenges players to understand the landscape, identify the locations of resources and threats, and determine the risks involved in collecting resources and protecting their plant. An online game developed to focus on the opium and tea trade between Britain and China and the events directly preceding the historic ‘Opium Wars’. You are invited to take control of your own independent trading company off the shores of the Pearl River Delta, leading up to the beginning of the first Opium War in 1838. Broker the best opium deals possible for sale in China, then buy as much tea as possible to send home and keep Britain happy! 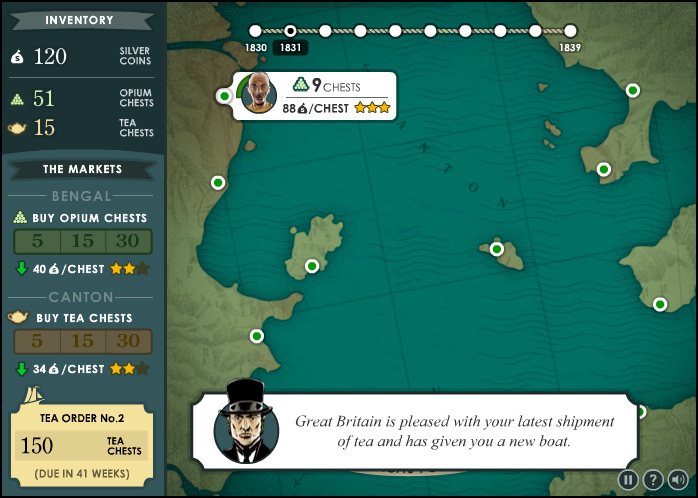 Aims of the game are to make money and increase your fleet through trading opium in return for silver, and maintain Britain’s happiness levels by feeding its relentless demand for tea. Various opium deals appear and disappear on the game map, and players must evaluate whether or not to accept them. Some deals have risks attached which can result in being busted by the authorities, so be careful!